– Orobanche major var. ritro sensu Willk., Suppl. Prodr. Fl. Hispan. : 188 (1893), non Orobanche major var. ritro (Gren.) Willk., Suppl. Prodr. Fl. Hispan. : 188 (1893). Obs. Willkomm, 1893: 188, sub O. major var. ritro (Gren.) Willk., "n. v."
Ind. loc. : "Holotypus: Marivella, pr. Calatayud (Huesca, Spain), 30TXL1781, 600 m, beside Echinops ritro in Genista sp. scrub, in the northern slope of a small valley, G. Moreno Moral MM0074/2008, 5-VII-2008 (MA). Isotypi adsunt in JBAG-Laínz et in herb. Sánchez Pedraja 13190 ... Huesca: Monzón ... Barbastro ... Teruel: Castelsarás ... Zaragoza: Calatayud ... Fuendetodos ... Almonacid de la Cuba ... Huérmeda ... Marivella..." (Carlón & al., 2011: 96). Holotypus / Holotype: "Marivella, pr. Calatayud (Huesca, Spain), 30TXL1781, 600 m, beside Echinops ritro in Genista sp. scrub, in the northern slope of a small valley, G. Moreno Moral MM0074/2008, 5-VII-2008 (MA). Isotypi adsunt in JBAG-Laínz et in herb. Sánchez Pedraja 13190" (Carlón & al., 2011: 96, 92 f. 1). Designated by: L. Carlón, M. Laínz, G. Moreno Moral & Ó. Sánchez Pedraja in Flora Montiberica 48: 96 (2011 [Jun 2011 (2 Jun 2011 online)]). Host: exclusively on Echinops species (E. ritro L. and E. sphaerocephalus L.), Compositae [Asteraceae] (Willkomm, 1893: 188, sub O. major var. ritro; Annotated Checklist of Host Plants of Orobanchaceae, accessed Apr 2010; Ferrández Palacio, 2016: 74, sub O. ritro). 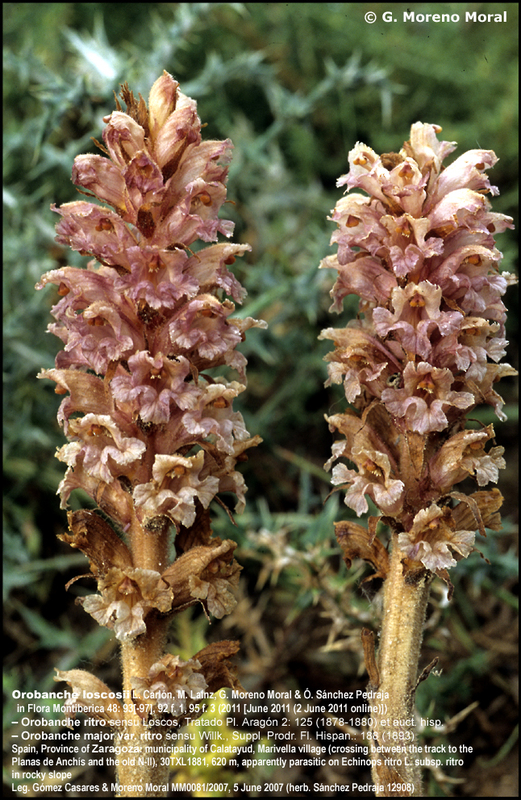 Morphological and taxonomic observations: Orobanche loscosii L. Carlón & al. [O. ritro sensu Loscos; O. major var. ritro sensu Willk. ], Orobanche kochii F.W. Schultz [Orobanche ritro Gren. 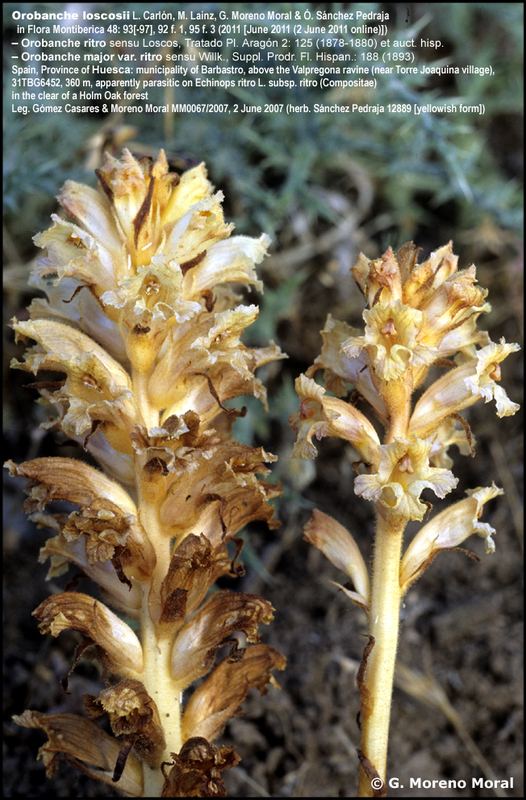 ], Orobanche leptantha Pomel [Orobanche curvata Pomel; O. icterica Pau] and Orobanche elatior Sutton [O. major auct.] are considered conspecific by many authors (e.g., Chater & Webb, 1972: 292; Greuter & al., 1989: 260; Foley, 2001: 71). But in our taxonomic treatment we have preferred to consider these taxa as different species, which have different morphological characters and, frequently, different host plants. According to Pujadas, 2013: 161 "O. loscosii should be included among the synonyms for O. ritro". In our study, we indicated for the first time the main differential characters (e.g., the stigma color) between these species (Carlón & al., 2011). According to Tela Botanica 2006, O. ritri Gren. in Gren. & Godr., Fl. France 2: 634 (1853) is a synonym of Orobanche major L. (accessed Oct 2006), under Tela Botanica 11.09.2012, O. ritro Gren. 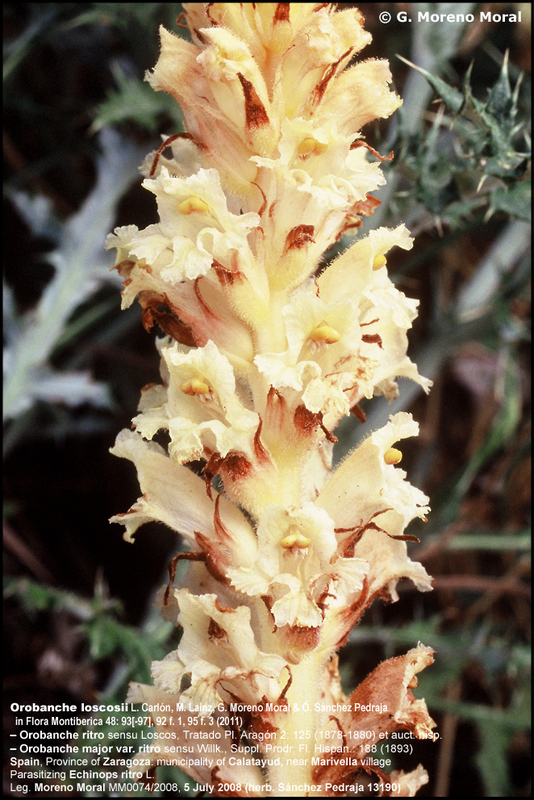 (1853) is a synonym of Orobanche kochii F.W. Schultz and under Tela Botanica 07.01.2012 is a synonym of Orobanche elatior Sutton. First photography and Phylogenetic observation: Carlón & al. in Documentos Jard. Bot. Atlántico (Gijón) 2: 31-32 [sub Orobanche major L. β Ritro], 40 t. 17 (2003); Documentos Jard. Bot. Atlántico (Gijón) 3: 56 [sub Orobanche ritro] (2005); Documentos Jard. Bot. Atlántico (Gijón) 6: 13 f. 2 ["Phylogenetic relationships", sub O. ritro], 15 [EU655617, herb. Sánchez Pedraja 12889, sub O. ritro] (2008). Ic. : a, Holotype: "Marivella, pr. Calatayud ... Spain)" (Carlón & al., 2011: 96, 92 f. 1); b, inflorescences (Azuara, Spain; on Echinops ritro L. [red flowering form]); c, flowers (ib. ); d, inflorescences (Fuendetodos, Spain; on Echinops ritro L. [red flowering form]); e, inflorescences (Torre Joaquina, Spain; apparently parasitic on Echinops ritro L. [yellow flowering form]); f, inflorescence (Marivella, Spain [red flowering form]); g, inflorescence (Marivella, Spain [yellow flowering form]). 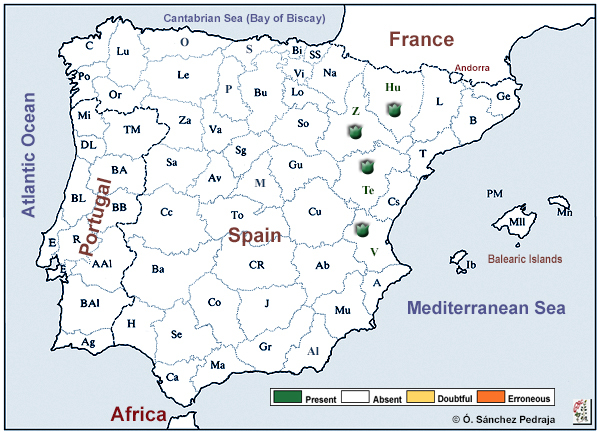 Distribution: Iberian Peninsula distribution (endemic to Iberian Peninsula). Huesca (Hu): municipality of Almunia de San Juan, Val Mayor [Cinca Medio], 31TBG7445, 410 m, J.V. Ferrández Palacio, 21 Jun 2001 (Ferrández Palacio, 2004: 443, sub O. ritro); "Barbastro, Pr. Torre Joaquina, yesos, sobre Echinops ritro, 31TBG6452, 360 m, 22-V-2003, J.V. Ferrández, JVF 13303." (O. ritro by Pujadas in Atlas de la Flora de Aragón, accessed 15 Jul 2011); municipality of Barbastro, above the Valpregona ravine (near Torre Joaquina village) [Somontano de Barbastro], 31TBG6452, 360 m, apparently parasitic on Echinops ritro L. subsp. ritro (Compositae) in the clear of a Holm Oak forest, G. Gómez Casares & G. Moreno Moral MM0067/2007, 2 Jun 2007 (herb. Sánchez Pedraja 12889 [we could see a large number of specimenes]) (Carlón & al., 2008: 13 f. 2 ["Phylogenetic relationships"], 15 [EU655617, sub O. ritro]); municipality of Monzón, western side of the Monzón vertex (near Monzón village [Cinca Medio]), 31TBG6743, 340 m, apparently parasitic on Echinops ritro L. subsp. ritro, G. Gómez Casares & G. Moreno Moral MM0066/2007, 2 June 2007 (herb. Sánchez Pedraja 12888 [a dozen stunted specimens, two of them were sprouting]); "Orobanche loscosii (O. ritro) / Almunia de San Juan [Cinca Medio]" (photo by José Vicente Ferrández in Por la Gesa de la Almunia de San Juan (Huesca) y su flora, accessed Jun 2015); "31TBG984641, Tolva, pr. castillo de Falls, sobre Echinops sphaerocephalus en ladera sobre yesos del Keuper, 629-633 m, 1-VII-2014, J.V.F. (det. A. Pujadas; JACA R297081). Primera cita para el ámbito pirenaico. En Huesca se conocían algunas localidades situadas más al sur, en el Cinca Medio y Somontano de Barbastro (cf. AFA y Ferrández, 2004: 443)." (Ferrández Palacio, 2016: 74, sub O. ritro). Teruel (Te): "Orobanche minor Sutt. / β procerior Rchb. (O. barbata Rchb.) / Cabezo de S. Cristóbal pr. Calaceite / Leg. Loscos 1863" (COI 00056903; rev. A. Pujadas, II-2005 sub O. icterica Pau; rev. Ó. Sánchez Pedraja 22 Mar 2012); "Castelserás no rara sobre Echinops 10 Jun. 1872 (Loscos)" (Loscos, 1878-1880 : 125, sub "1.770. O. ritro Gr. Godr. "); "In Arag. austr. (pr. Castelserás ad rad. Echinops Ritro. Losc. [Loscos])" [Teruel Province] (Willkomm, 1893: 188, sub Orobanche major var. ritro (Gren.) Willk. ); "en Aragón en el Cabezo de San Cristóbal de Calaceite (Loscos)" (Colmeiro, 1888: 278, sub O. barbata Poir., non Rchb. ); "Hispania! : S. Cristobal prope Calaceite Aragoniae (leg. Loscos)" (Beck, 1890: 172 sub O. major L., 173 "F. Loscos, Plantae Aragoniae austr. nr. 39 (sub O. barbata Poir.)! "; Beck, 1930: 248 sub O. major L., 252 "F. Loscos, Pl. Aragoniae n. 39! (sub O. barbata Poir. )"); "Arag. austr. (pr. Calaceite in Cabezo de S. Cristóbal, Losc.! teste Beck)" (Willkomm, 1893: 188, sub O. major L.; Beck, 1930: 248, sub O. major L.; Uhlich & al., 1995: 137, sub O. elatior). Zaragoza / Saragossa (Z): "B. et C. Vicioso Herbarium Aragonense / Calatayud-(España) / Orobanche flava Mart. / Calatayud [ N 41° 21' 0'' W 1° 38' 0'', c. 564 m] 25-5-1908 / Leg. Vicioso. C." (MA 115090; rev. Carlón, G. Moreno Moral & Ó. Sánchez Pedraja Nov 2011 [the sheet contains three specimens which seem to correspond to yellow forms of O. loscosii]); "Orobanche lutea Baugm major? [o. s.] / Calatayud [ N 41° 21' 0'' W 1° 38' 0'', c. 564 m] 9/5 1909 / para comprobar [o. s.] / Leg. C. Vicioso" (MA 115076; rev. L. Carlón, G. Moreno Moral & Ó. Sánchez Pedraja Nov 2011 [the sheet contains two specimens which seem to correspond to yellow forms of O. loscosii]) (Vicioso, 1912: 101(13), sub O. lutea Baugm); "B. et C. Vicioso Herbarium Aragonense / Calatayud-(España) / Orobanche caryophyllacea Sm / = (O. Galii Vauch.) / In vineis / Calatayud [N 41° 21' 0'' W 1° 38' 0'', c. 564 m] 28-5-1910 / Leg. Vicioso. C." (MA 115042; rev. ut Orobanche ritro auct. [= O. loscosii], L. Carlón, G. Moreno Moral & Ó. Sánchez Pedraja 2003); 1. "Caroli Pau - Herbarium hispanicum". – 2. "B. et C. Vicioso Herbarium Aragonense / nº 17 Calatayud (España) / Orobanche / viñas de Marivella / Junio 1911 / B. Vicioso" (MA 435793; rev. ut Orobanche ritro auct. [= O. loscosii], Carlón, Moreno Moral & Sánchez Pedraja, 2003); "Calatayud", N 41° 21' 0'' W 1° 38' 0'', c. 564 m [Vicioso, 1911, sub O. major L.; Vicioso, 1912: 101(13), sub O. major L.; Pujadas & al., 2005: 124, sub O. icterica, "...Calatayud, 9.vi.1908, B. Vicioso (MA 115075). Calatayud, Campiel, 4.v.1909, C. Vicioso (MA 115041)"]; "B. et C. Vicioso Herbarium Aragonense / Calatayud-(España) / Orobanche caryophyllacea Sm / = (O. Galii Vauch.) / In vineis / Calatayud [N 41° 21' 0'' W 1° 38' 0'', c. 564 m] 28-5-1910 / Leg. Vicioso. C." (MA 115042; rev. ut O. ritro Gren. (1853), Carlón, Moreno Moral & Sánchez Pedraja, 2003 [rev. ut O. loscosii L. Carlón, M. Laínz, G. Moreno Moral & Ó. Sánchez Pedraja Jun 2011]); 1. "Caroli Pau - Herbarium hispanicum". – 2. "B. et C. Vicioso Herbarium Aragonense / nº 17 Calatayud (España) / Orobanche / viñas de Marivella / Junio 1911 / B. Vicioso" (MA 435793; rev. ut Orobanche ritro Gren. (1853), L. Carlón, G. Moreno Moral & Ó. Sánchez Pedraja, 2003 [rev. ut O. loscosii L. Carlón, M. Laínz, G. Moreno Moral & Ó. Sánchez Pedraja Jun 2011]); municipality of Azuara (road to Fuendetodos, A-220, km 53 [former km 33]) (Campo de Belchite), 30TXL7977, 585 m, apparently parasitic on Echinops ritro L. subsp. ritro (Compositae), G. Gómez Casares & G. Moreno Moral MM0116/2003, 30 May 2003 (herb. Sánchez Pedraja 11381) (Carlón & al., 2003: 31-32, 40 t. 17, sub O. major var. ritro (Gren. & Godr.) Willk. ); municipality of Fuendetodos, at 1.3 km from the crossing of the A-220 (between the road to Belchite-Fuendetodos and the CV1021), 30TXL8076, 570 m, parasitic on E. ritro L. subsp. ritro (Compositae), G. Gómez Casares & G. Moreno Moral MM0117/2003, 30 May 2003 (herb. Sánchez Pedraja 11382) (Carlón & al., 2003: 31-32, 40 t. 17, sub O. major var. ritro (Gren. & Godr.) Willk. ); Fuendetodos, a 1,3 km del cruce de la A-220 (Belchite-Fuendetodos con la CV1021, 30TXL8076, 570 m, sobre E. ritro L. subsp. ritro (Compositae), G. Gómez Casares & G. Moreno Moral, 06/07/2003 (obs. ); municipality of Fuendetodos, road to Fuendetodos village, 30TXL8076, 570 m, parasitic on E. ritro L. subsp. ritro (Compositae), G. Moreno Moral, 23 June 2004 (obs. ); municipality of Calatayud, Marivella village (crossing between the track to the Planas de Anchís and the old N-II), 30TXL1881, 620 m, apparently parasitic on Echinops ritro L. subsp. ritro in rocky slope, G. Gómez Casares & G. Moreno Moral MM0081/2007, 5 June 2007 (herb. Sánchez Pedraja 12908 [only a pair of specimens]); municipality of Calatayud, above the camping of Calatayud city (near Calatayud city), 30TXL1780, 570 m, apparently parasitic on Echinops ritro, in sunny and stony soils, G. Moreno Moral, 25/05/2008 (obs. ); Calatayud, pista que sube de Huérmeda al páramo de Marivella —sobre Huérmeda—, 30TXL1781, 600 m, junto a E. ritro L., G. Moreno Moral, 04/07/2008 (obs. [only one dry and stunted specimen]); municipality of Calatayud, near Marivella village, 30TXL1780, 600 m, apparently on Echinops ritro L. at the edge of sunny terraces with ancient vinyards, G. Moreno Moral, 05.07.2008 (obs. [yellow flowering form] [perhaps, this could be the place where the taxon was collected by B. and C. Vicioso. Your indications seem to support this hypothesis and, moreover, the taxon is relatively abundant in this place. We could see around fifteen specimens. They were always yellowish (the specimens photographed near here, last year, were reddish). ]); Calatayud, pr. Marivella, 30TXL1781, 600 m, junto a Echinops ritro L. entre matorral de Genista sp., en ladera orientada al norte de pequeña vaguada, G. Moreno Moral MM0074/2008, 05.07.2008 (herb. Sánchez Pedraja 13190 [this population was composed of twenty specimens]); municipality of Calatayud, near Marivella village, 30TXL1780, 600 m, apparently on Echinops ritro L. in Genista sp. scrub, in the northern slope of a small valley, G. Moreno Moral MM0074B/2008, 5 Jul 2008 (herb. Sánchez Pedraja 13190B) [yellow form]; Almonacid de la Cuba, cerca del Balsete de Segarra (km 53.600 de la carretera de Belchite a Fuendetodos, pr. Almonacid de la Cuba, Campo de Belchite), 30TXL7976, 590 m, aparentemente sobre Echinops ritro, en ribazo sobre barbecho, G. Moreno Moral, 29-VI-2015 (obs.). Note. We believe that Orobanche loscosii L. Carlón & al. (2011) [O. ritro auct. hisp.] is probably the more appropriate name for some of the specimens gathered by C. Vicioso in Saragossa province (e.g. MA 115042; MA 435793) (cf. Carlón & al., 2003: 40). Anthos (Proyecto). Sistema de información sobre las plantas de España (Spanish plants information system). Ministerio de Medio Ambiente. Fundación Biodiversidad. Real Jardín Botánico, CSIC. http://www.anthos.es/v21/ (accessed Jun 2011). Carlón, L., Laínz, M., Moreno Moral, G. & Sánchez Pedraja, Ó. 2011 [Jun 2011 (2 Jun 2011 online)]. 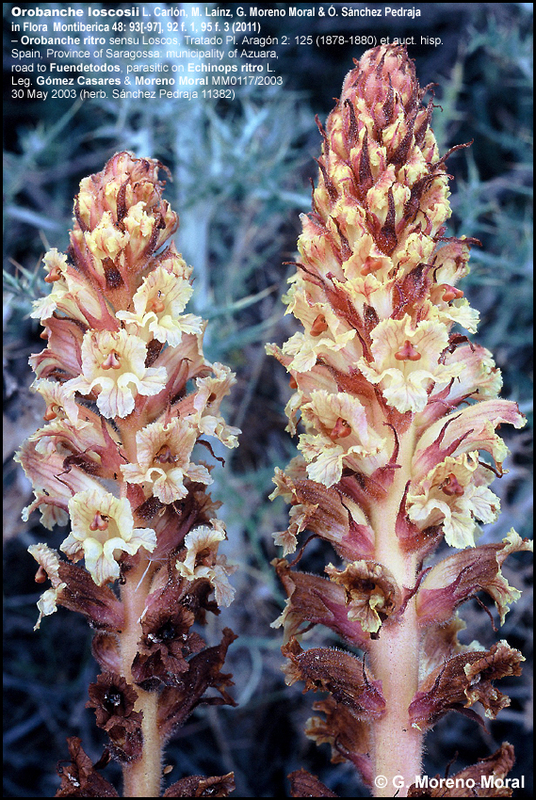 A new species (Orobanche loscosii), a prioritary name for O. icterica (O. leptantha) and a new member of the spanish flora (O. elatior). Fl. Montiber. 48: 89-101. ISSN 1138/595. Colmeiro, M. 1888. Enumeración y revisión de las plantas de la Península hispano-lusitana é Islas Baleares, vol. 4. Madrid. [Orobancaceas: 270-281]. Domina, G. & Raab-Straube, E. 2010. Orobanche ritro. Orobanchaceae. In: Euro+Med Plantbase - the information resource for Euro-Mediterranean plant diversity (accessed 20 Jul 2010). Ferrández Palacio, J.V. 2004. Catalogo Floristico de la Comarca del Cinca Medio (Provincia de Huesca). Col. Tolous 13. Centro de Estudios de Monzon y Cinca Medio. Huesca. Ferrández Palacio, J.V. 2016 [Jul 2016]. Aportaciones a la flora de la provincia de Huesca, I. Flora Montiberica 64: 62-79. ISSN 1135-5952, ISSN-e 1988-799X. Foley, M.J.Y. 2001. 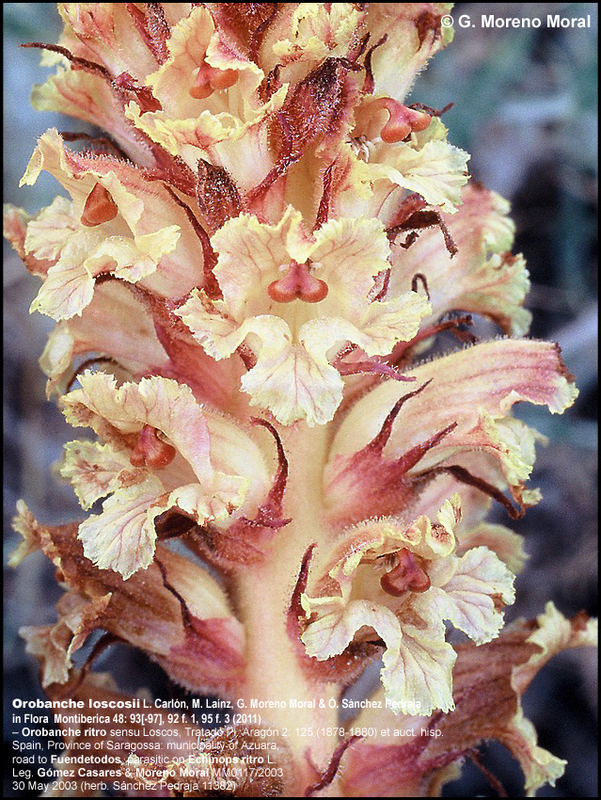 Orobanche L. In Paiva, J., Sales, F., Hedge, I.C., Aedo, C., Aldasoro, J.J., Castroviejo, S., Herrero, A. & Velayos, M. (eds.). Flora iberica 14: 32-72 + 235-251 (Suplemento Fotográfico). Madrid. 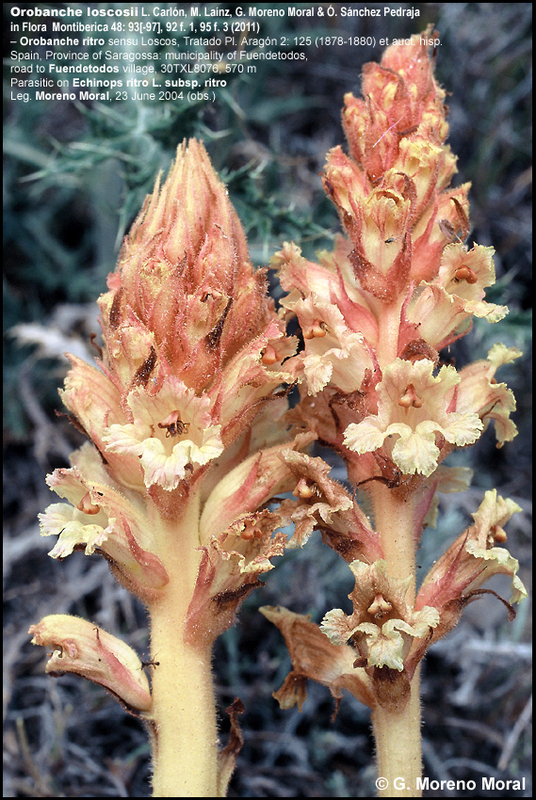 http://www.rjb.csic.es/floraiberica/floraiberica/texto/pdfs/14_05%20orobanche.pdf (accessed 21 Sept. 2007). Loscos, F. 1878-1880 . Tratado de plantas de Aragón. Parte segunda (pp. -445). Madrid. Establecimiento Tipográfico del Hospicio. Pujadas, A. 2012 [30 May 2012]. 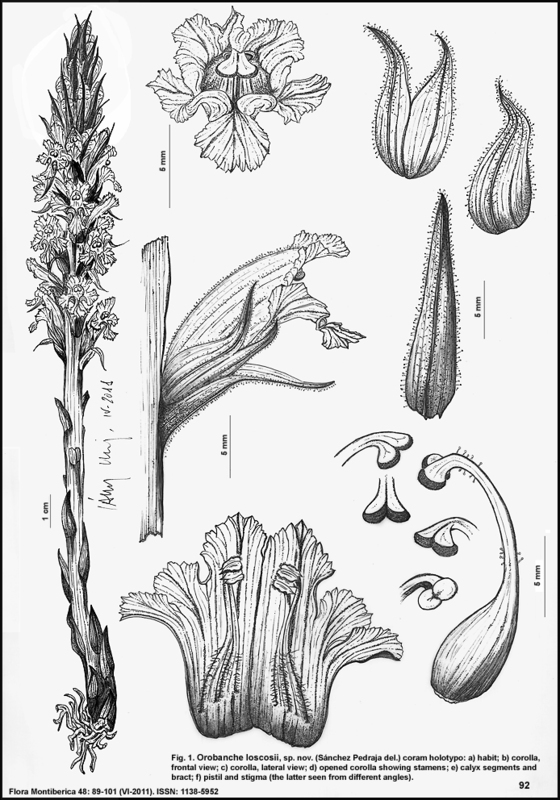 Typification and characterization of Orobanche ritro Gren. & Godr. (Orobanchaceae) of central and southern Europe. Acta Bot. Gallica 159(1): 67-72. Pujadas, A. 2013 [25 March 2013]. Orobanche icterica Pau and Orobanche ritro Gren. & Godr. (Orobanchaceae) in the Iberian Flora. Orobanche icterica Pau y Orobanche ritro Gren. & Godr. (Orobanchaceae) en la flora Ibérica. Acta botánica malacitana 38: 160-162. Willkomm, M. 1893. Supplementum prodromi florae hispanicae. Stuttgart. [Fam. Orobanchaceae: 185-191, 328]. Zázvorka, J. 2010. Orobanche kochii and O. elatior (Orobanchaceae) in central Europe. Acta Musei Moraviae, Sci. Biol. (Brno) 95(2): 77-119 (pdf).